In June 1784 Joshua Waddington, a tory merchant and businessman, was sued for £8,000 by Elizabeth Rutgers. He had taken over her brewery when the British occupied New York during the Revolution, using it for his gain, while she fled the city. Alexander Hamilton, an old friend of Waddington's was his attorney. He argued that because New York was occupied by a foreign power and under miitary order, certain laws were suspended and his client was not liable for anything during that period. He won the suit but this had serious ramifications for Hamilton. He had angered the supporters of state sovereignty and created international tension; he retained numerous enemies as a result of this case until his death. Waddington, on the other hand prospered. He had many dealings with David Ogden, one in particular where they founded a town on the upper St.Lawrence River, which he named Hamilton after his late friend. 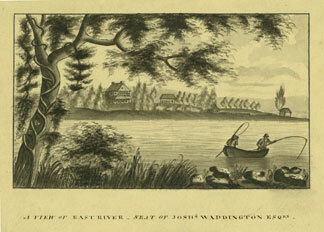 The name was later changed to Waddington, New York. 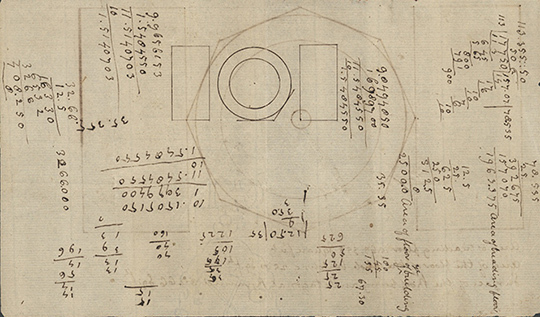 An original Eighteenth Century drawing of an octagonal trading floor, possibly Virginia or North Carolina; two pages, oblong 8vo. On one side is a drawing with dimensions, "Area of trading floor 1963.355 Square feet; Are of the floor of the whole building 2500 sq.ft. 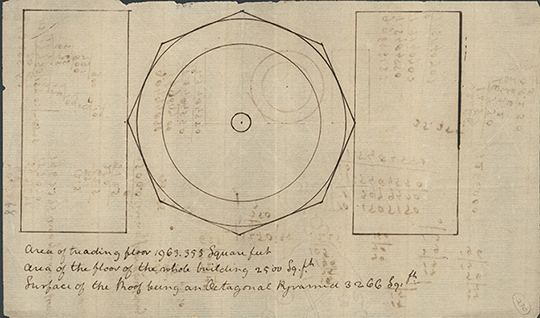 ; Surface of the roof being an Octagonal Pyramid 3266 Sq.ft..." The reverse is filled with calculations and a partial drawing of the floor. This may have been for trading grain or cattle. Extremely rare. 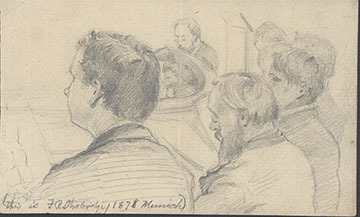 Original pencil drawing, 4 x 6 1/2 inches, 1878, Munich. Six or seven [eople in what appears to be boxes at an opera. Inscribed, also in pencil, "This is F R Dhobridge 1878 Munich". Crease in center, ex- Kennedy Galleries. 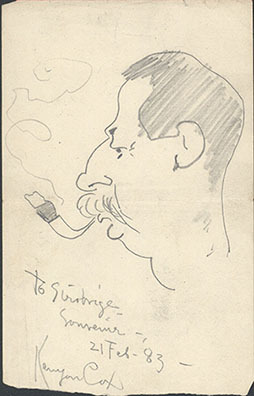 Small drawing of a man smoking a pipe, 6 1/2 x 4 inches, signed "Kenyon Cox", and inscribed, To Strobridge- Souvenir- 21 Feb. '83". 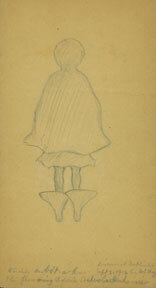 With an additional unsigned drawing on the reverse. Ex- Kennedy Galleries. See Collections section for full description.